The poll, conducted for the Center by Public Opinion Strategies, surveyed 1,000 Trump voters online from April 17-19 and has a margin of error of ±3.1 percentage points. Public Opinion Strategies also conducted eight focus groups in five locations from April 4-18 with both Trump voters as well as Republicans and independents who voted for Hillary Clinton or for a third-party candidate. — Respondents generally believed the country was headed in the right direction (70%) as opposed to being on the wrong track (22%), and two-thirds believed the economy has been improving since Trump took office. Yet the focus group respondents frequently expressed concern about how things in the country are going, using words like “terrible,” “upheaval,” “polarization,” “chaotic,” and “volatile” to describe the state of the country. 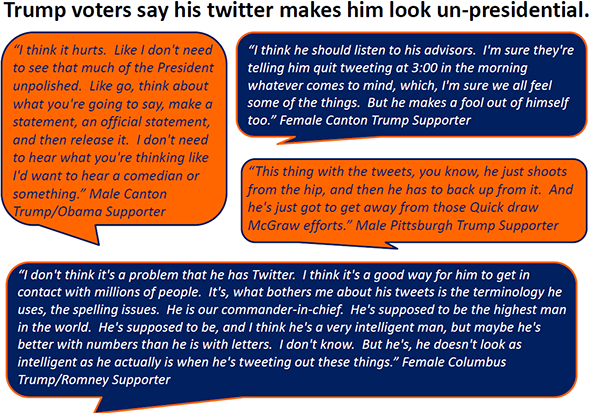 — To the extent that Trump voters expressed concern about the president, they worried about his tweeting. Nearly one-fifth of respondents (19%) cited “Twitter” as the top reason they feel unsure about their vote for Trump (the next most mentioned reason was the failed repeal of the Affordable Care Act, or “Obamacare,” at 11%). Respondents were mixed on whether they approved of his tweeting (55% approved, 45% disapproved). Younger voters tended to be more approving of Trump’s tweets than older ones. “This thing with the tweets, you know, he just shoots from the hip, and then he has to back up from it,” said one focus group participant in Pittsburgh. — One in five (20%) reported voting for Barack Obama at least once, and Trump’s approval rating was not quite as strong with these respondents (86% approve, 14% disapprove) as it was with the 80% of respondents who said they never voted for Obama (94%-6%). — Close to three-quarters of respondents (72%) believed that building a wall on the border with Mexico was at least “somewhat” important to them. However, given the choice to spend money on either building the wall or “fixing health care,” two-thirds preferred spending the money on health care. — Only 5% of respondents said that Trump was the most responsible for the failed initial attempt to repeal and replace the Affordable Care Act. Roughly half (48%) blamed Democrats, while the remainder blamed House Speaker Paul Ryan (12%), moderate Republicans (15%), or the conservative House Freedom Caucus (21%). Overall, about four in five respondents (81%) approved of House Republicans, but only 20% strongly approved (61% “somewhat” approved). Further complicating Trump and the Republicans’ calculations on the Affordable Care Act is that a not-insignificant portion of respondents — 26% of those surveyed — reported that they or their families would be hurt by making changes to Obamacare. The remaining three-quarters (74%) said that they and their families would be helped by making changes to the ACA. — Trump voters viewed Vice President Mike Pence very favorably (82% favorable-8% unfavorable), but had more mixed feelings about House Speaker Paul Ryan (52%-24%) or Senate Majority Leader Mitch McConnell (28%-26%). — Although respondents overwhelmingly disliked 2016 Democratic nominee Hillary Clinton (3% favorable, 92% unfavorable) and former President Barack Obama (9%-86%), they were a bit more mixed on other Democrats, such as former Vice President Joe Biden (20%-63%) and Sen. Bernie Sanders, the Vermont independent who ran for president last year in the Democratic primary (21%-61%). House Minority Leader Nancy Pelosi (5%-77%) elicited more strongly negative reactions than other prominent Democrats, like Senate Minority Leader Chuck Schumer (6%-47%) and Sen. Elizabeth Warren of Massachusetts (8%-55%), which perhaps helps to explain why Republicans continue to prominently feature Pelosi in attack ads targeted at Democrats. 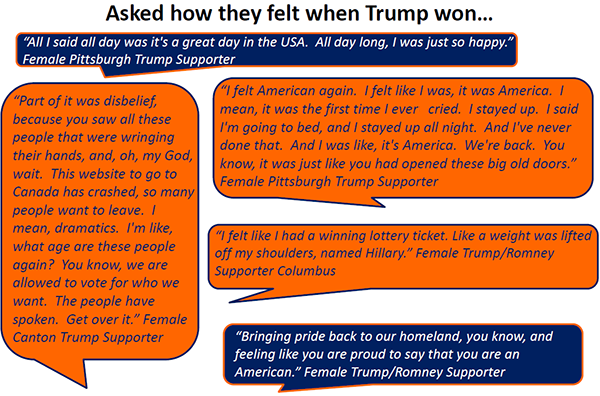 — While there has been much focus on the reactions of Clinton voters to the 2016 election outcome, Trump supporters were elated and pleased by it. Overall, 38% of respondents expressed “joy” at the outcome and 24% “pride.” Given the anti-Clinton nature of some Trump voters and the widespread expectations of a Clinton win, 51% conveyed “relief” and 37% expressed “surprise.” “I felt like I had a winning lottery ticket. Like a weight was lifted off my shoulders, named Hillary,” one woman in Columbus said. — Looking ahead to the 2018 midterm election, 78% of respondents said they planned to vote for the Republican candidate in their House district, 2% for the Democratic candidate, and 19% undecided. The undecided were most likely to identify as politically independent (53% of them) and ideologically moderate (37%). 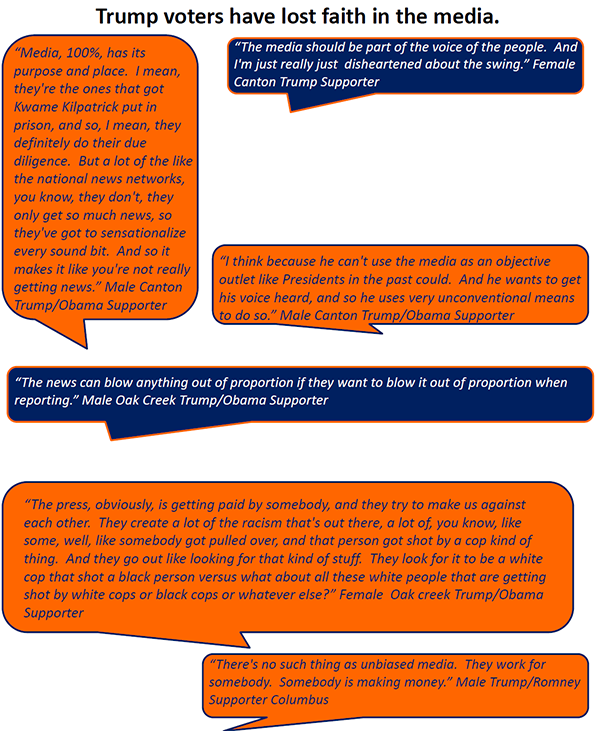 — Focus group participants were asked an open-ended question: “If Donald Trump were an animal, what kind of animal would he be, and why?” “Lion” was cited by Trump voters far more than any other animal — in one focus group of Proud Trump supporters in Pittsburgh, nine of 10 participants chose Lion. 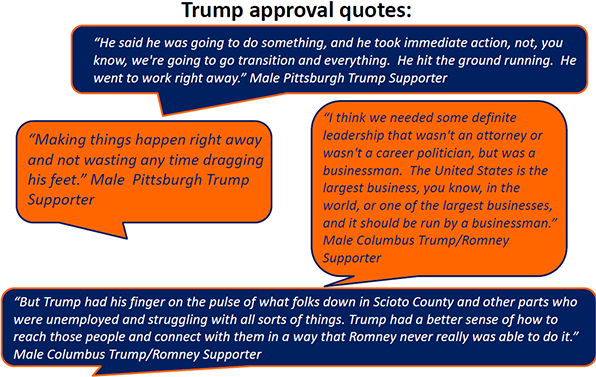 The full report, including more details from the poll and extensive quotes from the focus groups, is available at: http://www.centerforpolitics.org/crystalball/wp-content/uploads/2017/04/Trump_voter_poll_summary.pdf. The full poll results are available at: http://www.centerforpolitics.org/crystalball/wp-content/uploads/2017/04/Trump_voter_poll.pdf and the crosstabs are available at: http://www.centerforpolitics.org/crystalball/wp-content/uploads/2017/04/Trump_voter_poll_crosstabs.pdf. The focus groups were conducted in electorally important battleground areas of states Barack Obama won in 2012 that Trump flipped in 2016 — Columbus; Pittsburgh; Oak Creek, WI (Greater Milwaukee); and Canton, MI (Greater Detroit) — as well as in Houston, where Clinton strongly outperformed Obama’s 2012 showing. The Center for Politics decided to commission the poll and focus groups after the election as a way of checking in on Trump’s coalition early in his presidency. The election results last fall were a surprise to almost everybody in the field of political analysis, ourselves most definitely included. So the Center realized that it needed to learn as much as possible about the phenomenon of the Trump voter, and share it with others. This study is part of our educational efforts. The UVA Center for Politics worked with Glen Bolger and others at Public Opinion Strategies to conduct the poll and focus groups. The Center chose Public Opinion Strategies, a Republican firm, for two reasons: 1.) The Center has a long relationship with Bolger and respects his work and 2.) The poll and focus groups primarily studied Trump voters, a strongly Republican group, and thus it made sense to use a Republican firm. The last time the Center for Politics conducted a poll and focus groups was as a part of the Center’s Kennedy Half-Century project; for that study, the Center used Democratic pollsters Peter Hart and Geoff Garin in part because the study focused on a Democratic president.